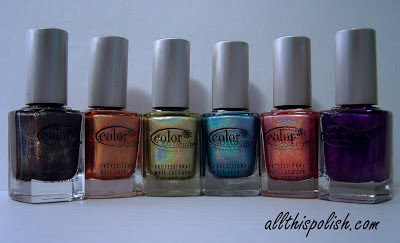 All This Polish: One Year Blogiversary Giveaway! That's right! One year ago today I took the plunge and published my first blog post here at All This Polish. I just want to thank those of you that have been reading, following and commenting for the past year. I know I don't post as often as some bloggers...I'm not always consistent and you probably thought I went AWOL for a few months there, but hopefully you've enjoyed the posts I have made so far! I just recently bought myself a set of the new 2013 Color Club Halo Hues set and they are gorgeous! I thought they would make a pretty good giveaway prize for my one year blogiversary, so I ordered up a second set and the polishes arrived a few days ago. I know there are quite a few people who have already bought themselves a set, so I decided to add a second prize so that those of you who may already have the Halo Hues set can enter to win something else. And since I'm only really comfortable trying to ship polishes within the US, I'm adding some gift certificates to Born Pretty Store as a third option, available as a prize only to those located outside of the United States. Hey there International readers! The Halo Hues set consists of 6 polishes (from left to right): Beyond, Cosmic Fate, Kismet, Over The Moon, Miss Bliss and Eternal Beauty. Again, you must be a U.S. resident to be eligible to win this prize. 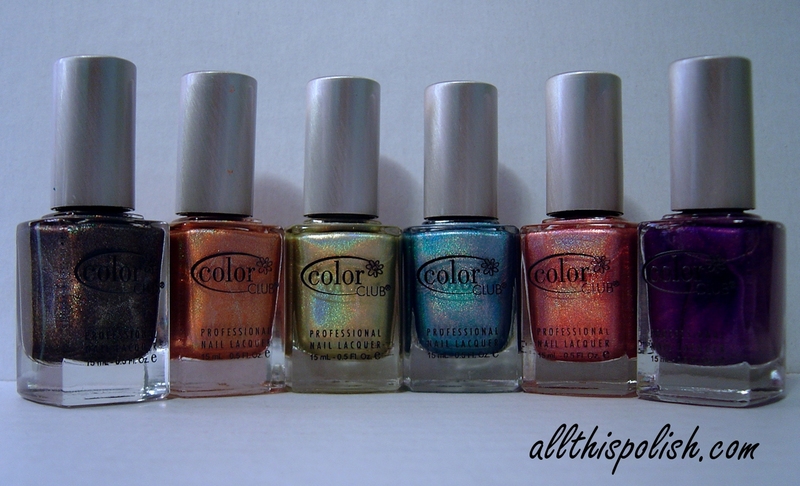 The Nail Polish Assortment consists of two a-england polishes: She Walks In Beauty and Lancelot; three Revlon polishes: Whimsical, Girly and Heavenly; a bottle of L.A. 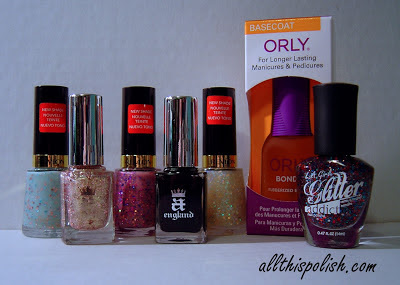 Girl Glitter Addict Celebrate, and a bottle of my favorite base coat, Orly Bonder. As with the Color Club polishes, you must be a U.S. resident to be eligible to win this prize. Finally, for my International readers, I'm offering the chance to win a $30 USD worth of eGift Certificates to Born Pretty Store. They have a ton of nail art supplies and other goodies, low prices and they have worldwide free shipping with no minimums! I will have a review of some nail art loose glitter from their shop that you should expect to see posted sometime later this month. But the gift certificates, as well as the other prizes, was bought and paid for with my own money. Only non-U.S. residents will be eligible for the Born Pretty Store eGift Cards. So, that's about it. A huge "Thanks!' one more time to everyone who has been reading along for the past year. Fill out the Rafflecopter below to enter. The giveaway starts right now and ends next week, Friday February 15th. Winners will be contacted within 24 hours of the end of the giveaway and then have 48 hours to reply or a new winner will be chosen. Being my first giveaway, hopefully I didn't screw this up too badly, so please bear with me! Quick reminder one more time: U.S. residents only eligible for polish prizes; non-U.S. residents only eligible for Born Pretty Store eGift Cards! Wow, those are all amazing prizes :) I can't even imagine how much stuff you'd be able to buy from Born Pretty Store for $30!